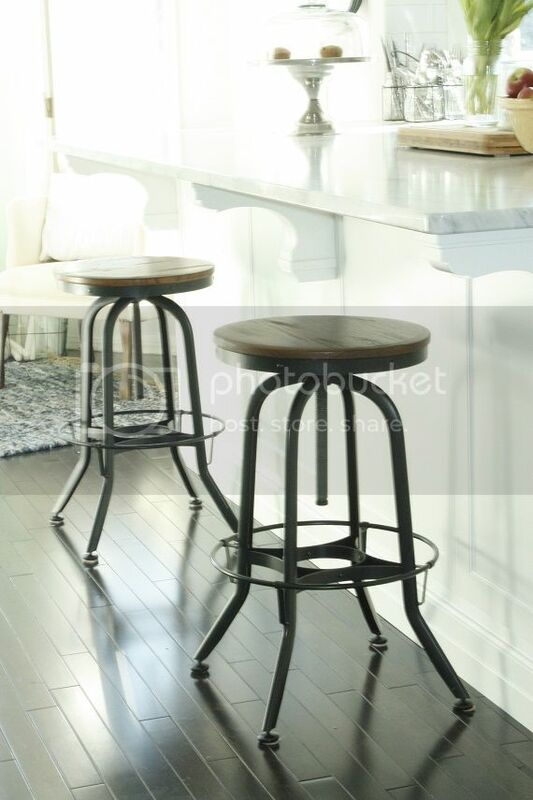 I have been wanting to share our new stools (thanks for the reminder in the last post Dawn!! ), but I've been waiting for the partner for our stool. I think I mentioned that we were eyeing the Restoration Hardware stools but found the $315 price tag (plus shipping) a tad high (I now see they are on sale for $255). 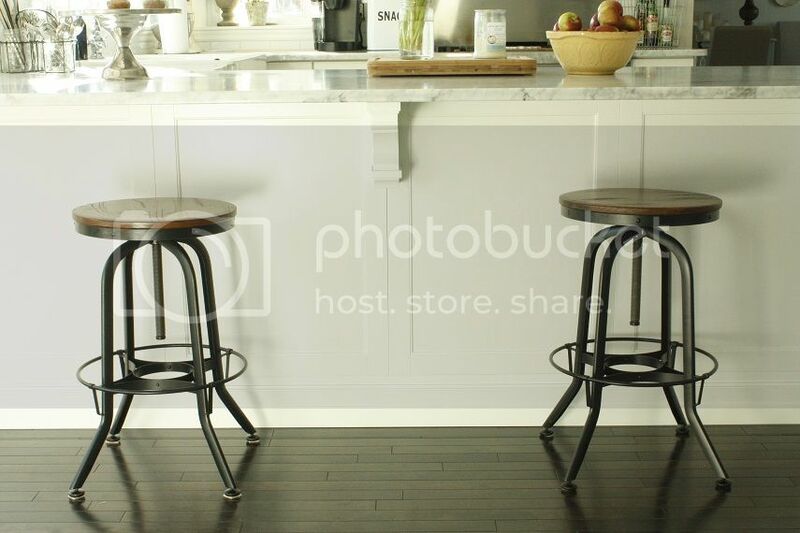 So while these look nearly identical, they aren't from restoration hardware. I debated on whether to post about our experience with the stools because I hate being a debbie downer, but at the end of the day I really REALLY want to save someone else the same trouble we had. A few months ago I saw these stools at a local boutique called Urbane. They were priced at $250 each so I decided that after the holidays we would order them and save ourselves about $200. We went in on January 2 and asked if we could order the stools but the sales associate told me that they were now $500 each. YIKES!! And to top if off they looked completely different to me. She was positive that there were no stools at $250 and even after I pointed out all the differences in the photos they emailed me she hesitated on pulling up any sort of pricing. Eventually she admitted they were different and that I could order the original ones I liked for $250 each. We paid and she told me she would call me a week later with details on when they would arrive. 2 weeks later I get a call asking if I was told what happened to my other stool. Ummm, no you were supposed to tell me what was going on, remember? Well it turns out that it arrived but was somehow crushed by a fork lift. But don't worry, they would rush order a new one. One week later I still hadn't heard when the new one would arrive so I called back and was told that this manufacturer doesn't ship until the truck is completely full so I would have to wait until more customers placed orders. Hello, that doesn't sound like a rush order to me?! I pointed out that it didn't seem too rushed based on that info and I kind of wanted to know when I could expect the other stool. I debated on just cancelling the order and returning the first stool to instead get the RH ones when somehow later that day a stool magically turns up and they brought it over... hmmmm. Anyways, I have both the stools now and while I love them I probably would have just paid the extra money and ordered the RH version since I have had nothing but amazing service there. Lesson learned! I think I will order another just because I feel like 2 isn't quite enough but 4 would be overwhelming for that ledge. Sean loves that he can lower his seat while Wren and I like our stools higher! Finally all the little touches of dark/black metal are making sense as everything comes together. 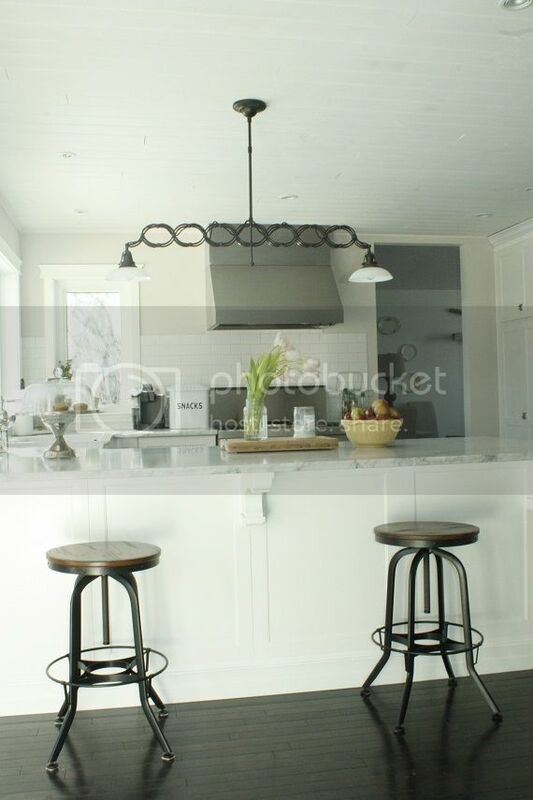 It's funny because this whole kitchen process seemed to be just one big fight from the cabinets to efaucets.com not shipping our tap and now these stools. The only companies I've worked with that I've had nothing but rave reviews for are Urban Granite who did our marble counters, Restoration Hardware who helped with the light and Tile Town who we ordered our subway tile with. Biggest lesson I've learned? You have to be really vocal to get what you want! Patiently waiting doesn't get you much, and sadly the thorn in the sides are usually the ones who get the fastest/best response.